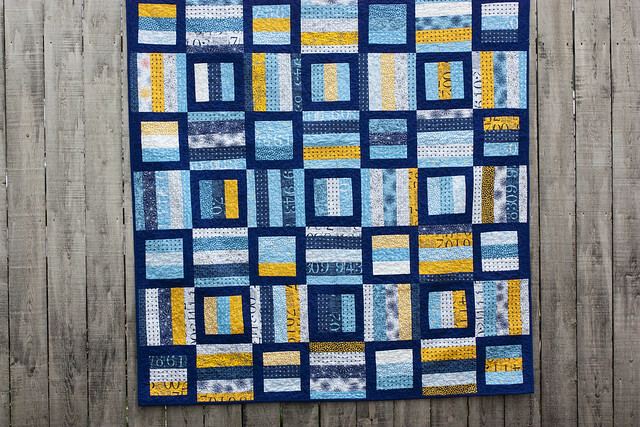 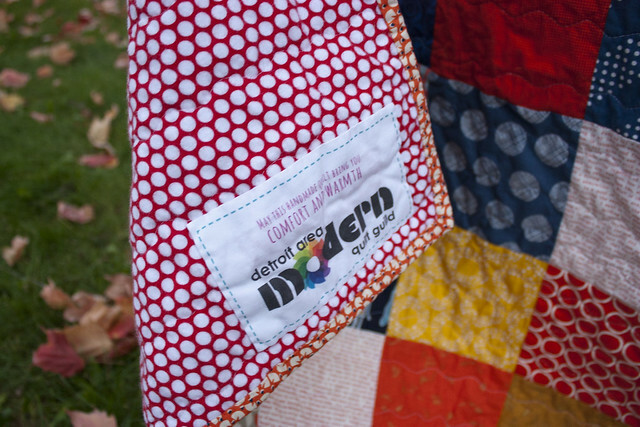 Here's a quick quilt that I put together for the Detroit Area Modern Quilt Guild's charity donation to Beaumont Children's Hospital in Royal Oak, MI. 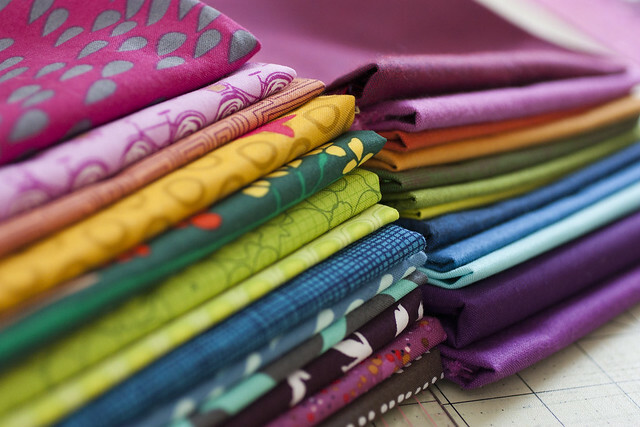 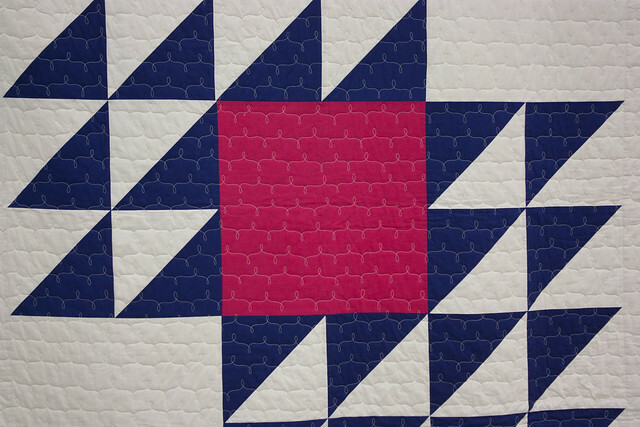 My favorite part of quilting is pairing fabrics, and it was fun to come up with a non-girly palette based on a robot print I had in my stash. 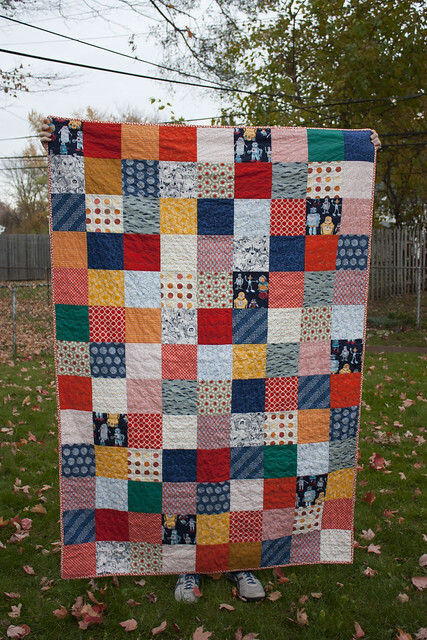 I pulled everything together back in September and then finally got around to finishing this at the beginning of November. 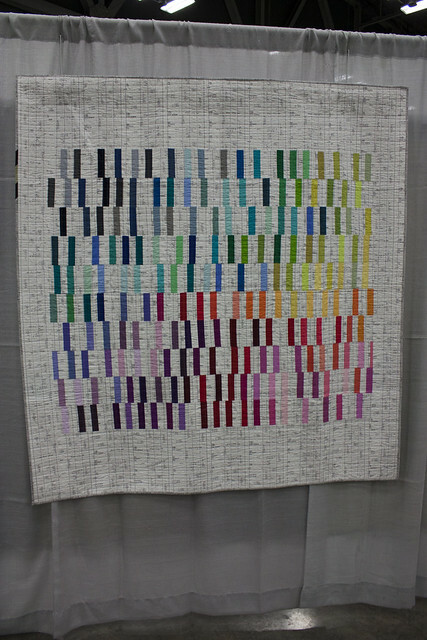 I used 6.5" squares (final size 6") in a grid of 9 squares by 13 squares. 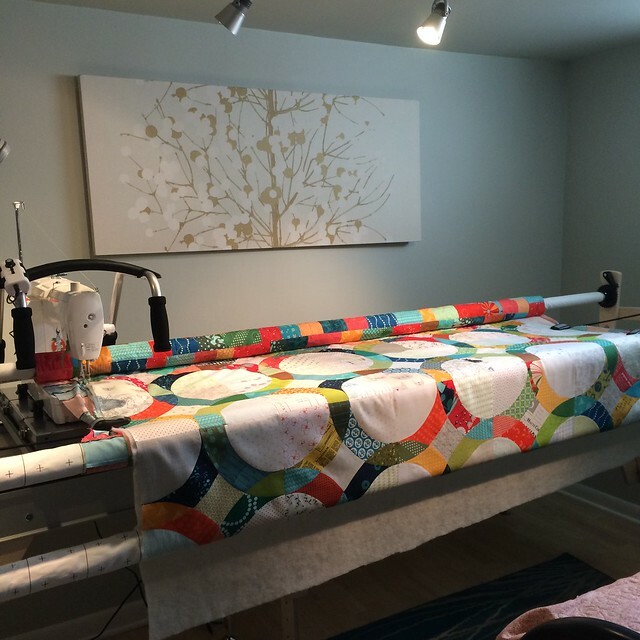 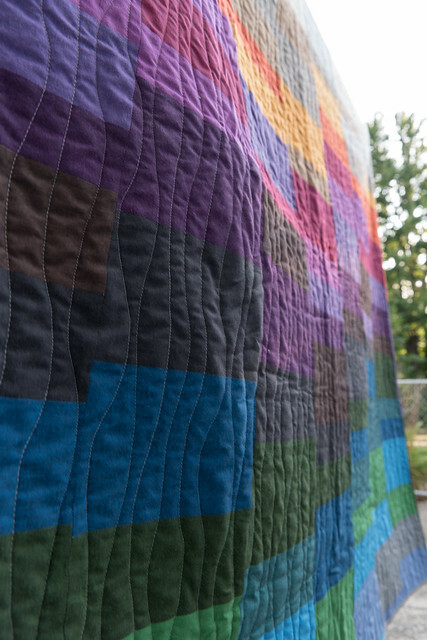 The final quilt is 54"x78" and should cover the entire length of a hospital bed. 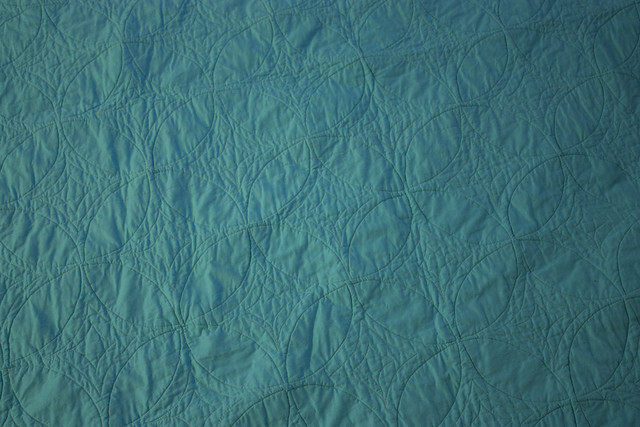 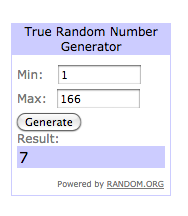 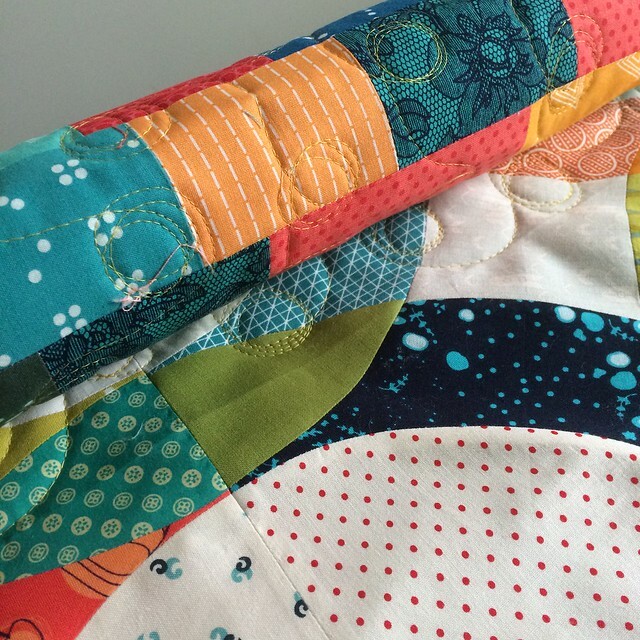 I backed the quilt in a super soft flannel and quilted it with wavy lines using my free motion foot. 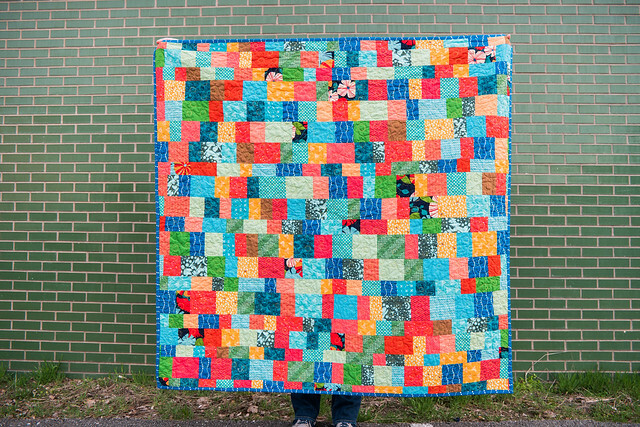 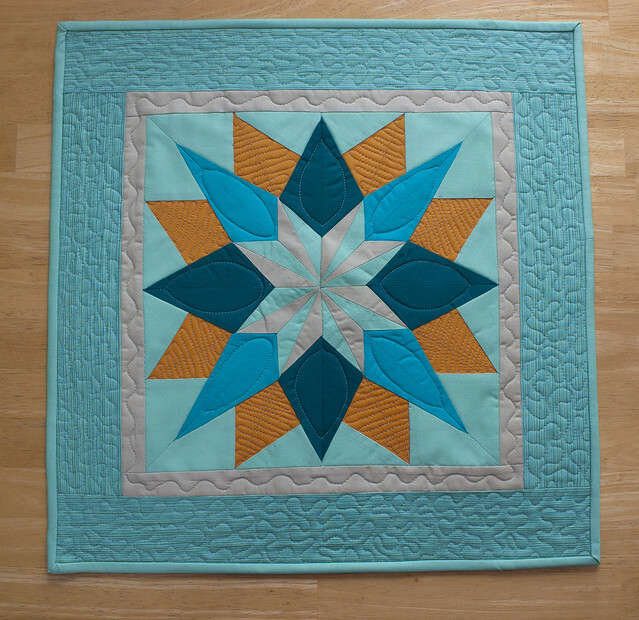 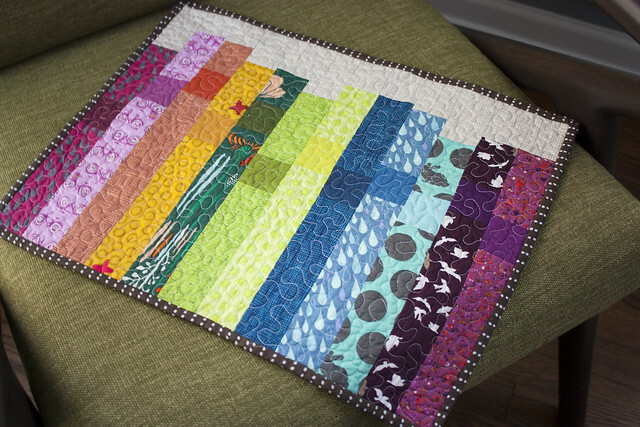 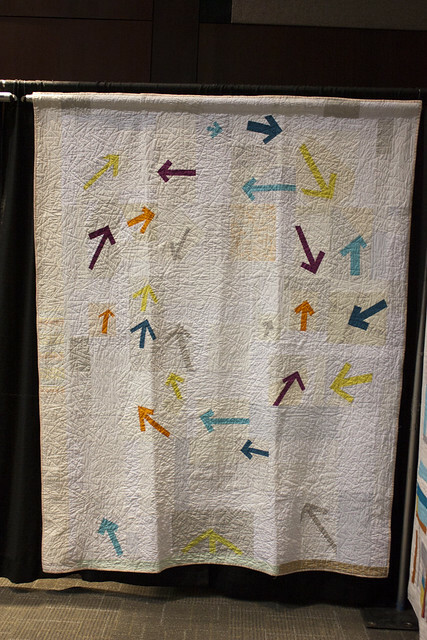 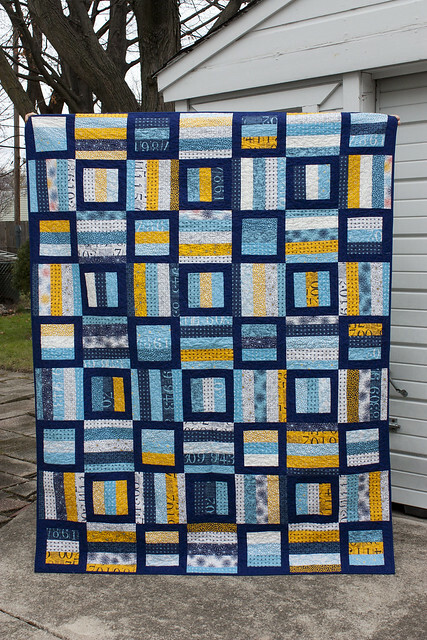 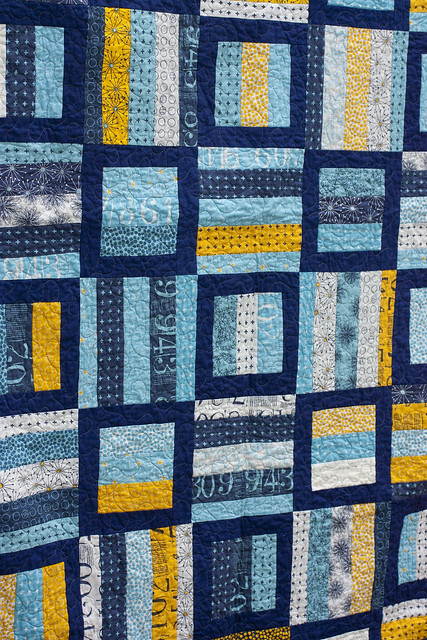 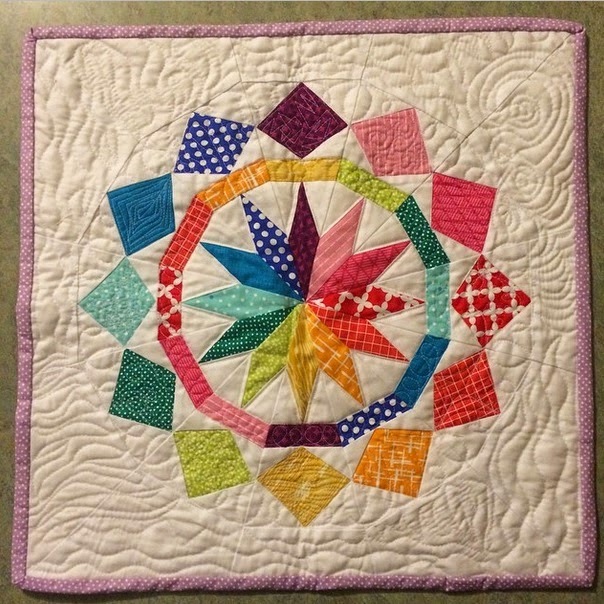 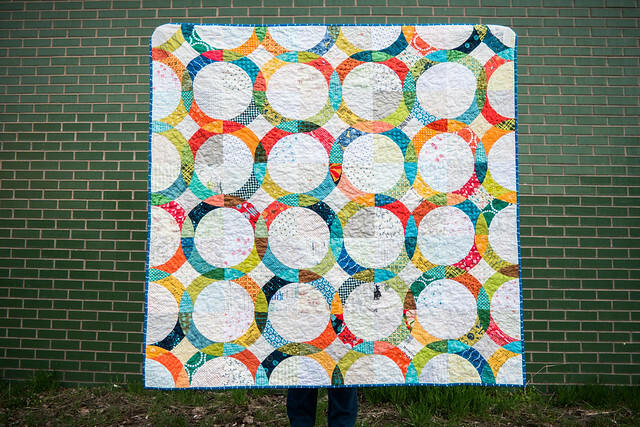 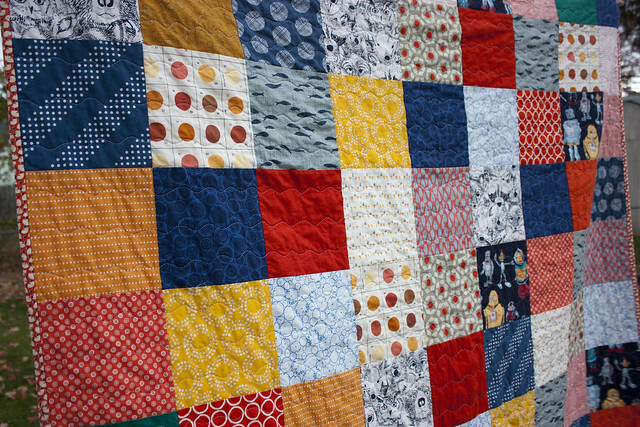 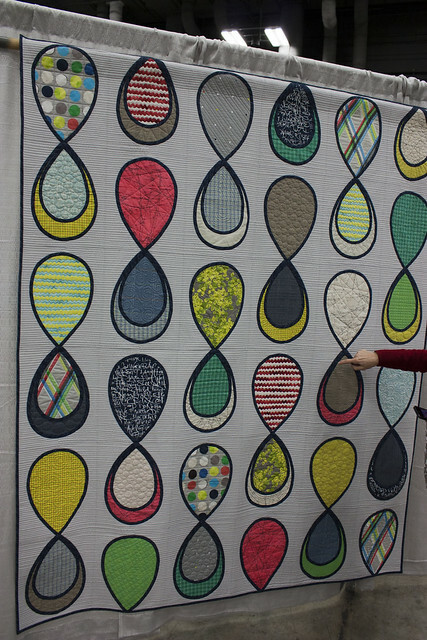 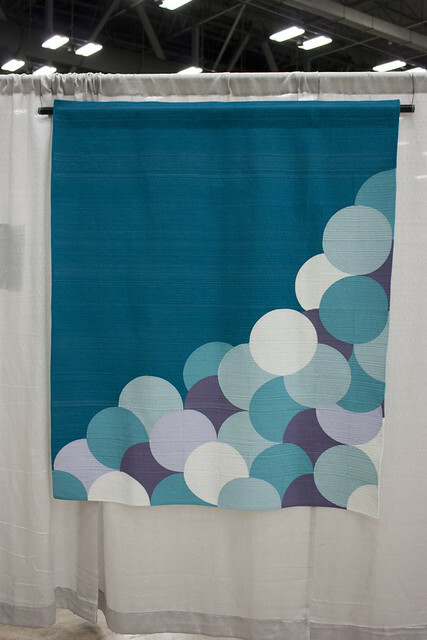 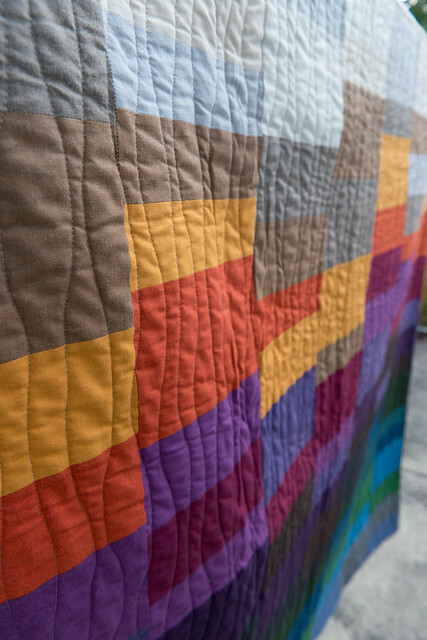 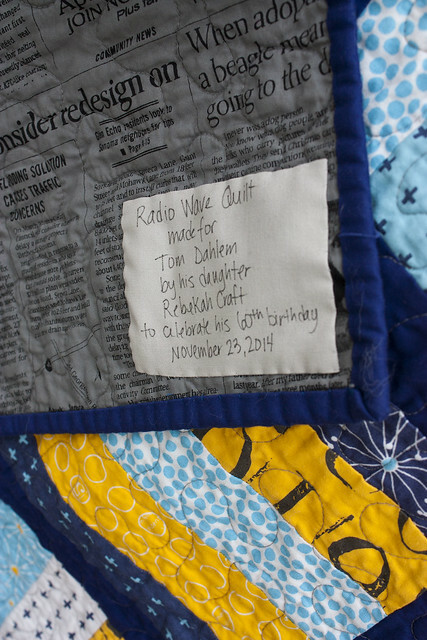 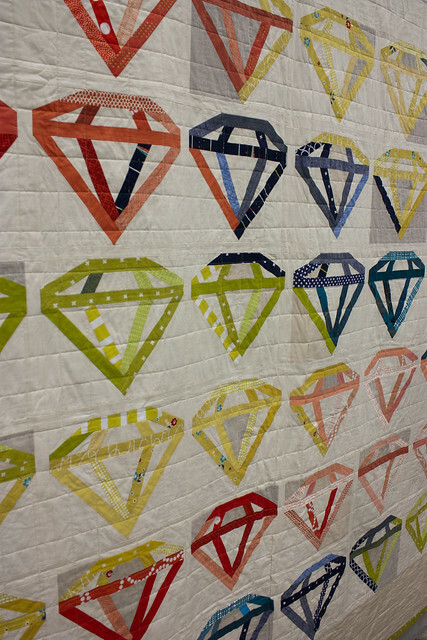 My favorite part of this quilt is the guild label, made by our graphic designer and guild member, Amanda. 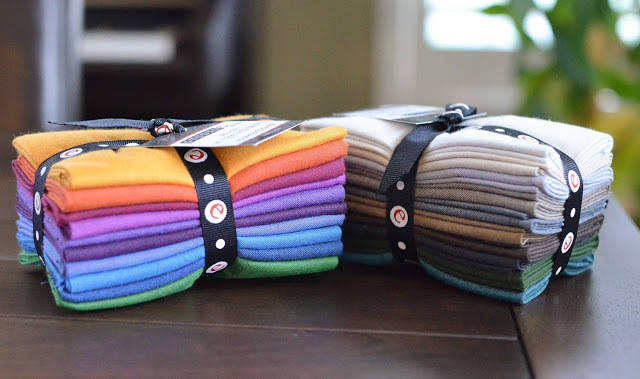 She did such a nice job on our branding and it was a great way to finish off the project. 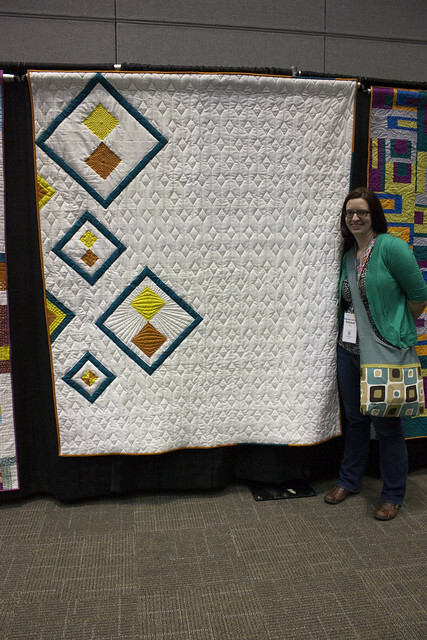 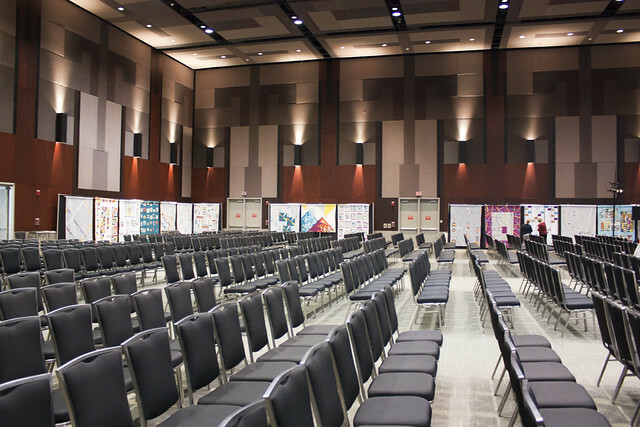 Sarah and I traveled together to Austin two weeks ago for QuiltCon 2015. 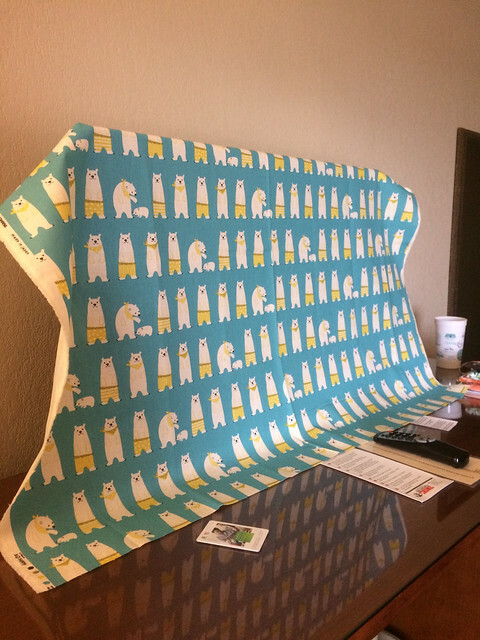 The whole experience was overwhelming in the best possible way. 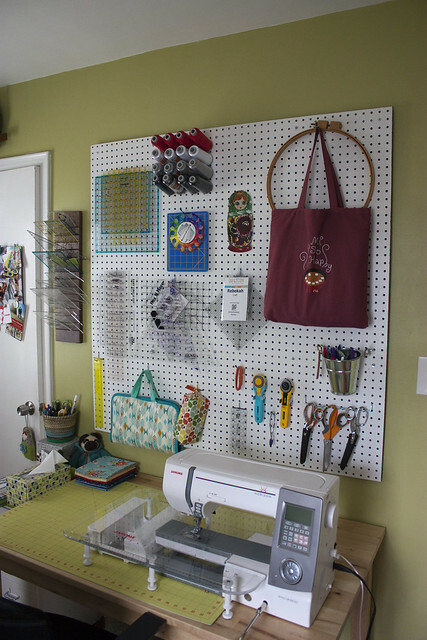 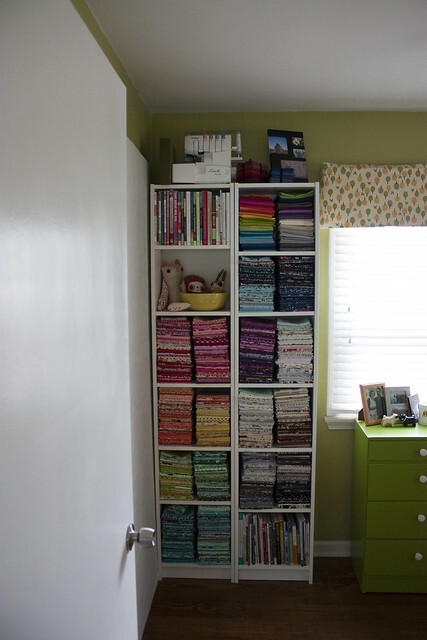 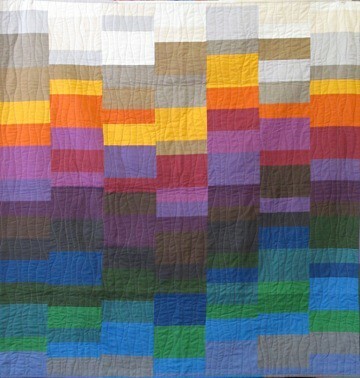 I think I'm still in recovery mode and my inspiration and urge to sew is at an all time high right now. 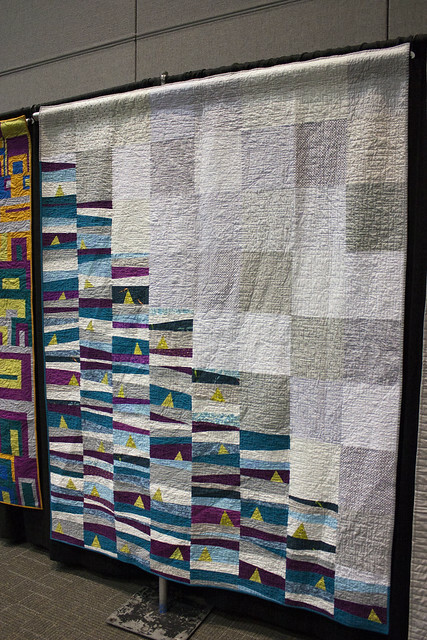 Because we didn't take any classes, we spent most of our time looking at quilts, attending lectures and buying everything in sight at the vendor booths. 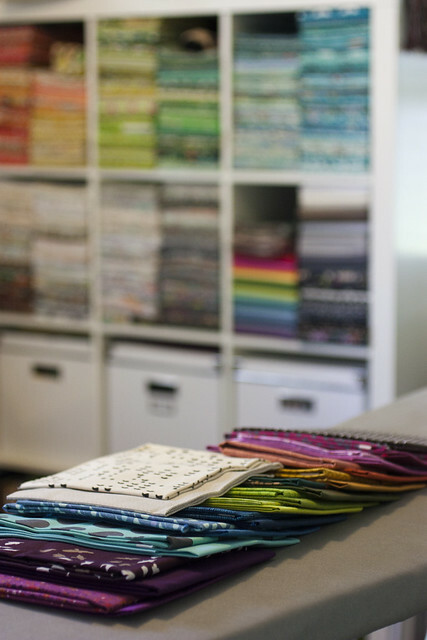 Looking back, keeping myself busy in classes probably would have been a great way to channel my creative energy and reduce my shopping haul! 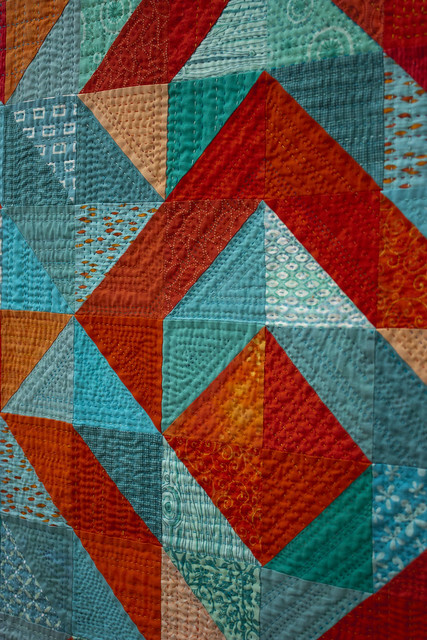 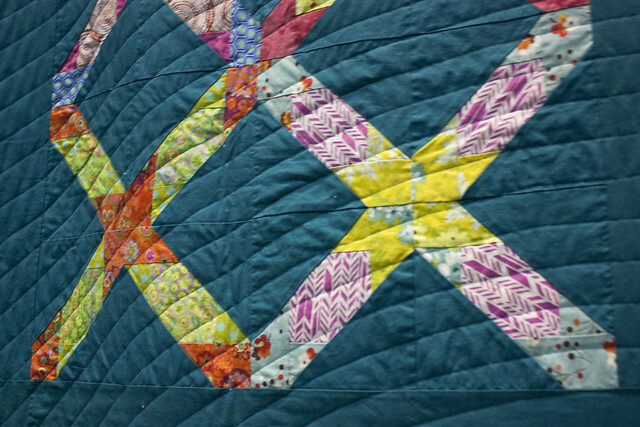 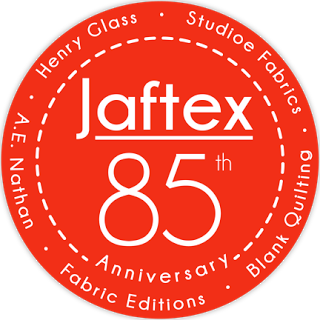 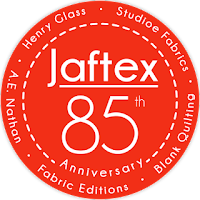 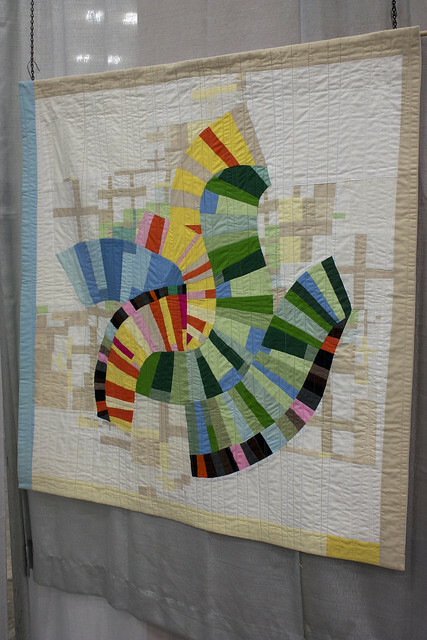 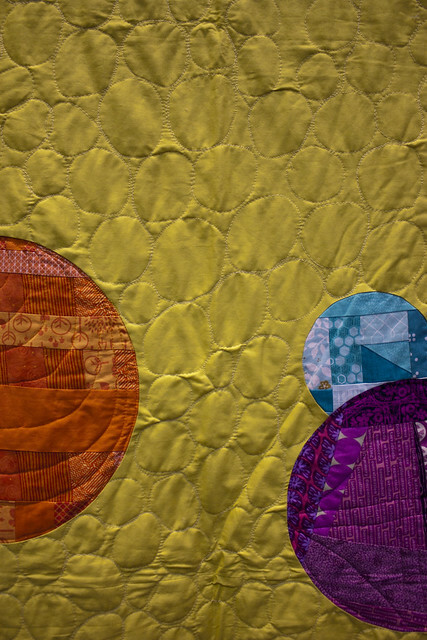 Of the lectures, Yoshiko Jinzenji's Simple Quilts, Bill Kerr's Details Matter and Susan Beal's Modern Quilt Documentation lectures were the highlights for me. 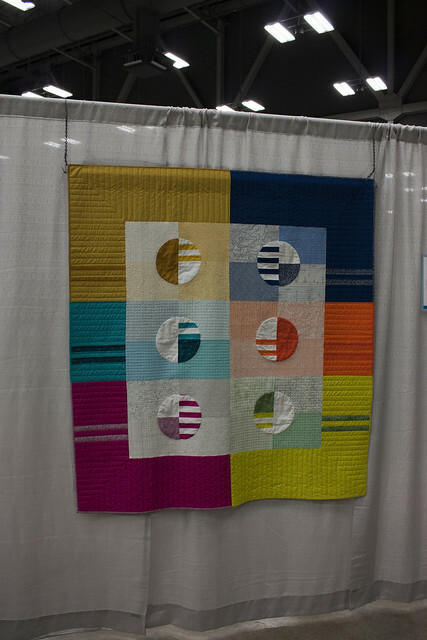 It was so nice to meet long time blog friends, Shea, Liz and Krista and to connect with so many other people who share my love of quilting. 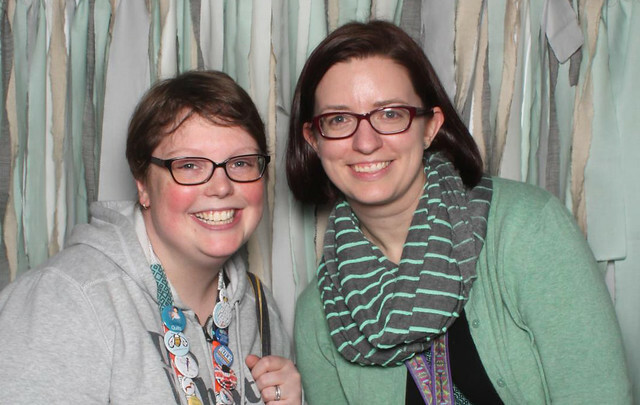 We also had fun catching up with our guild members for meals and drinks each night. 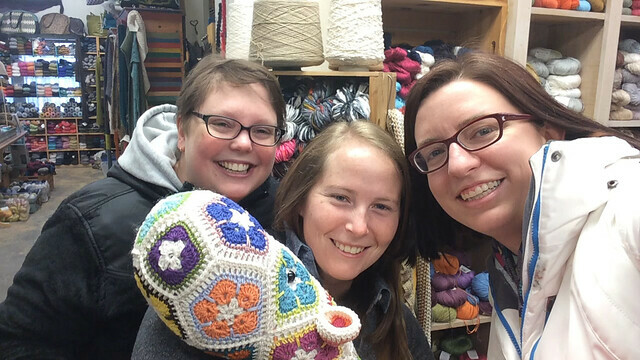 For someone who would rather be home binge watching TV shows with Jon or listening to an audiobook and crafting away, I was exhausted after being out and about so much! 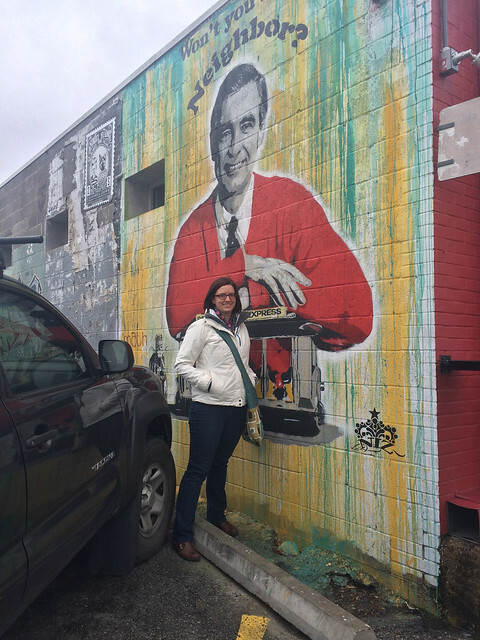 Unfortunately we didn't get out and tour much of Austin, but we did catch a few food trucks, the infamous Gourdough's donuts, Hill Country Weavers, Home Slice (home of the Mr. Roger's mural), and the adorable sewing shop, Stitch Lab. 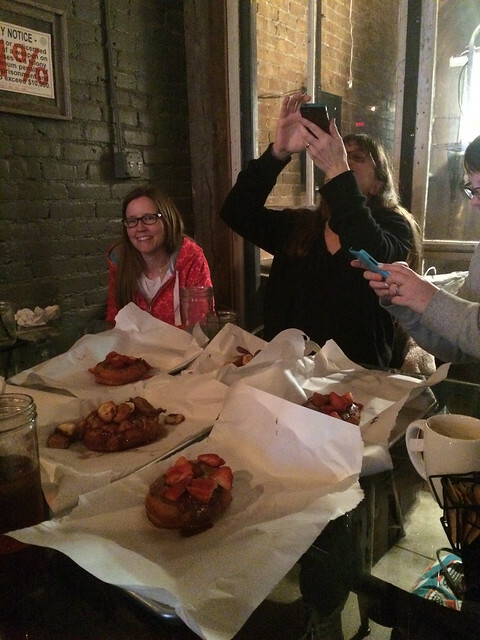 You'll have to trust me that the donuts were more tasty than they were photogenic. 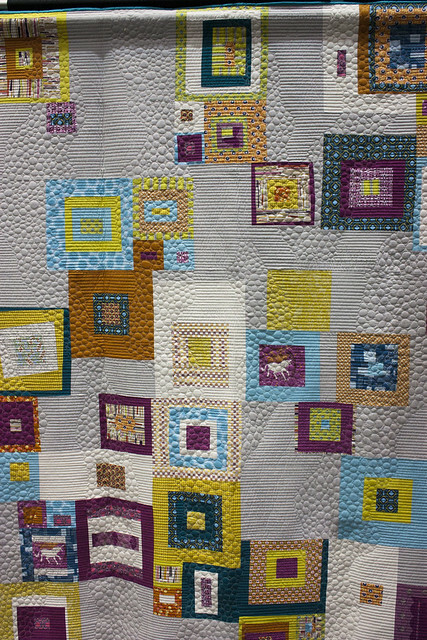 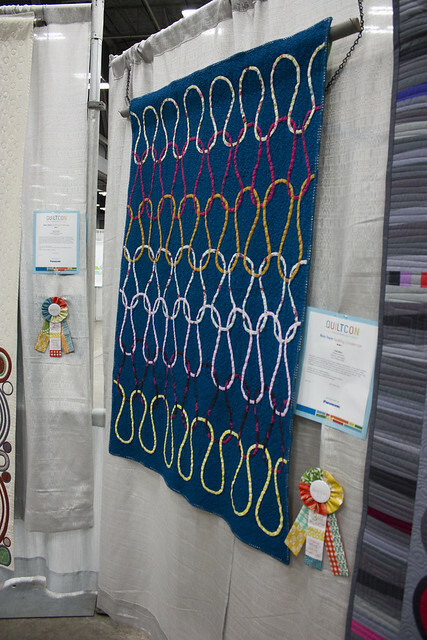 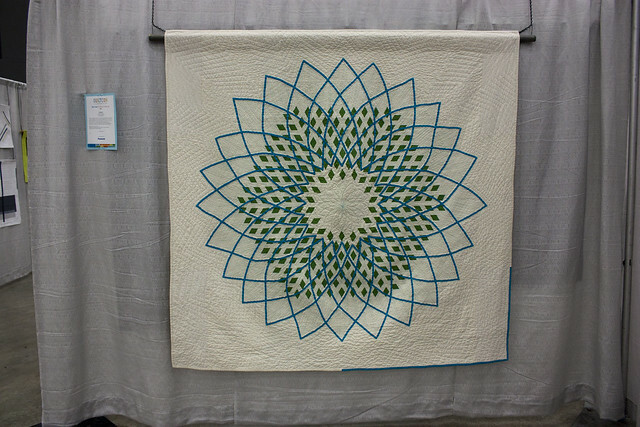 Here are a my favorite quilts from the juried show. 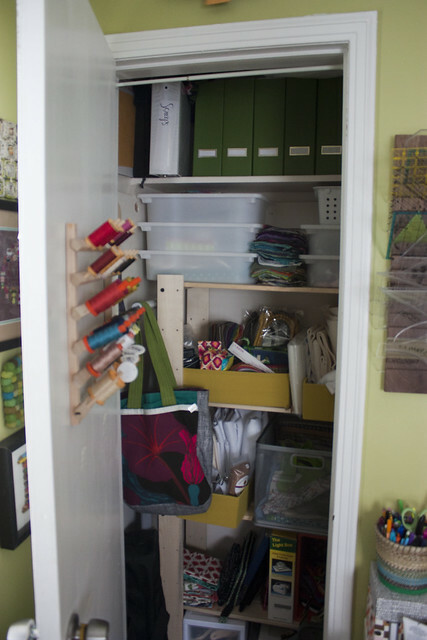 You can see my full album here. 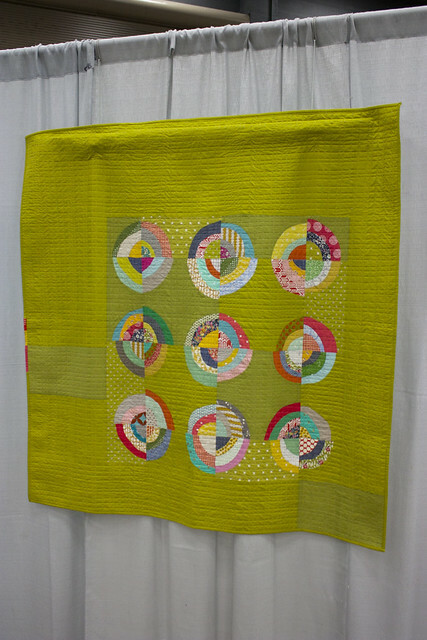 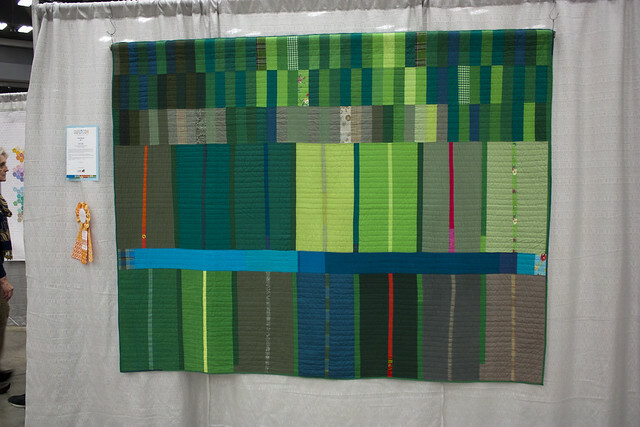 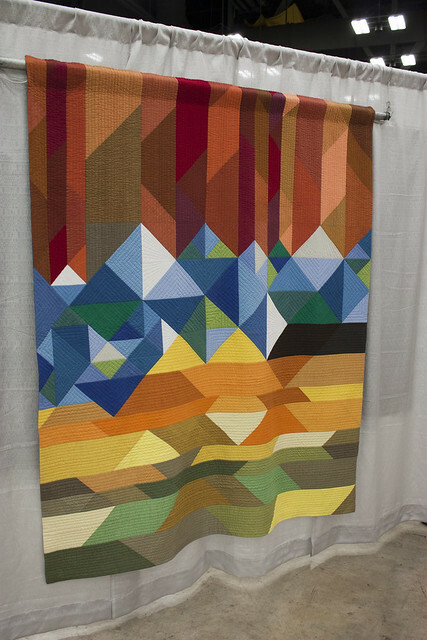 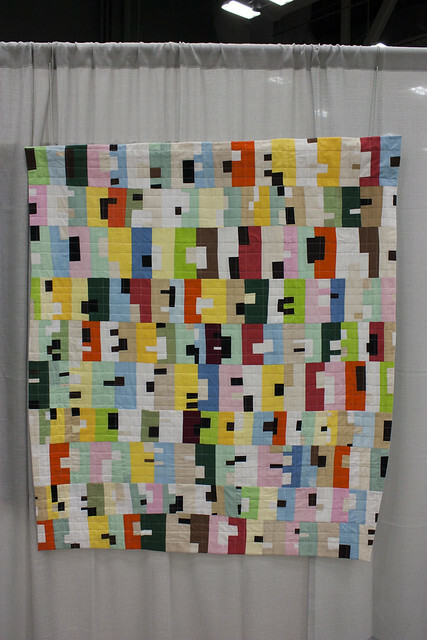 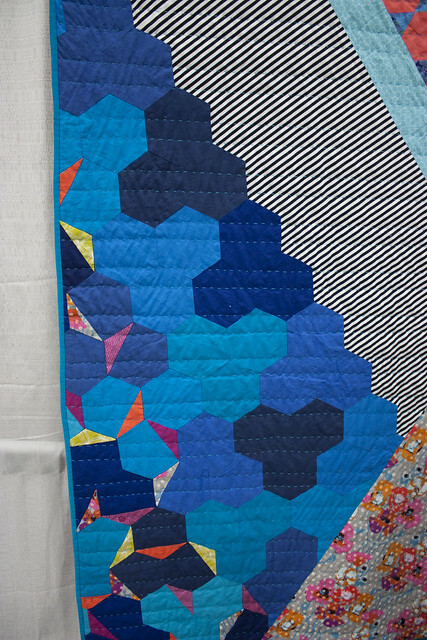 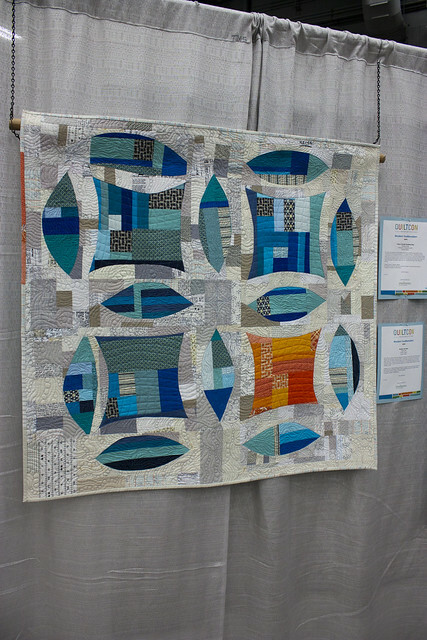 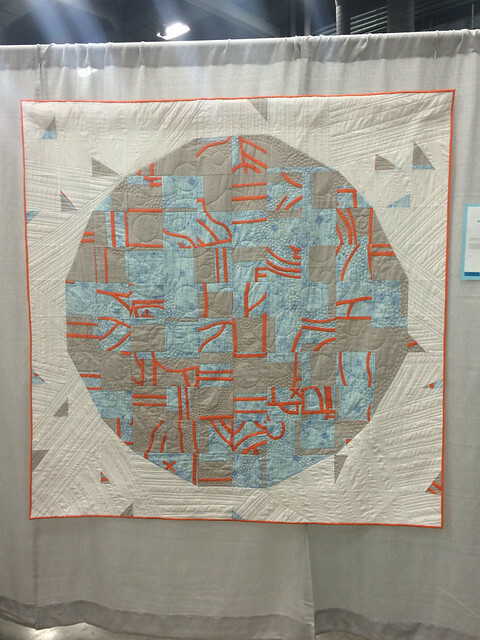 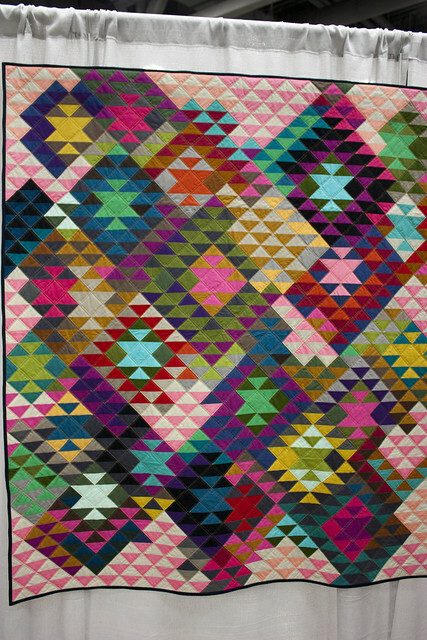 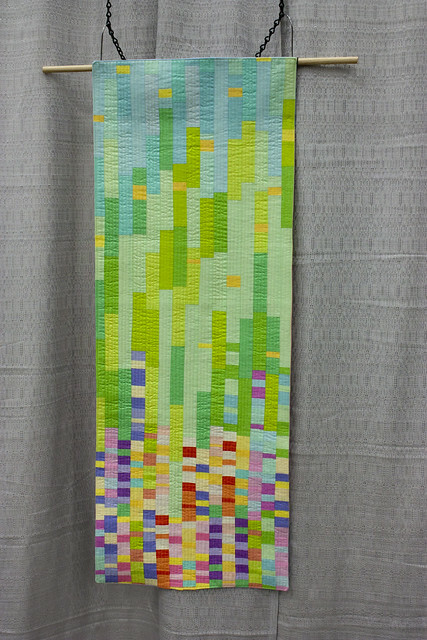 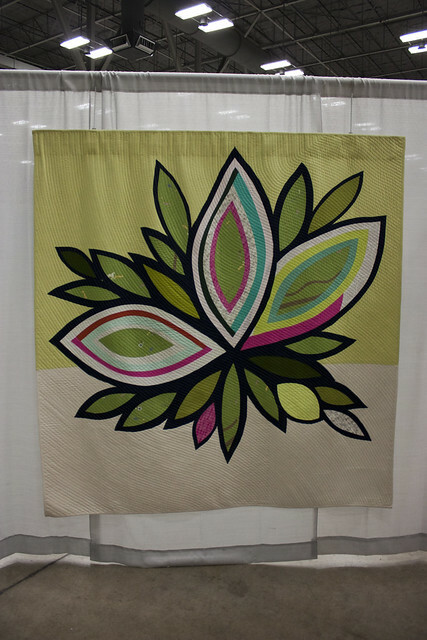 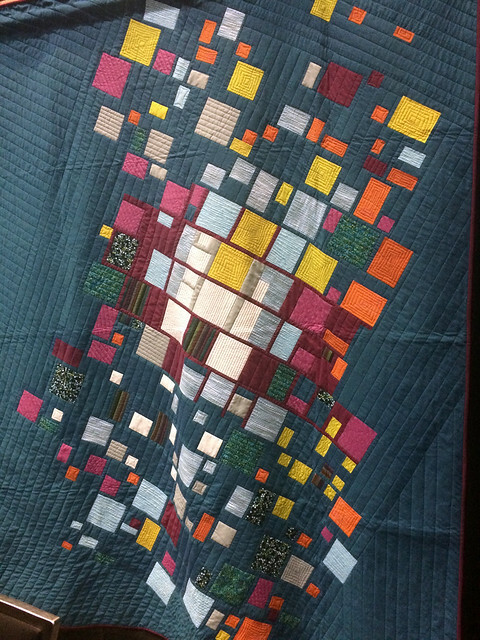 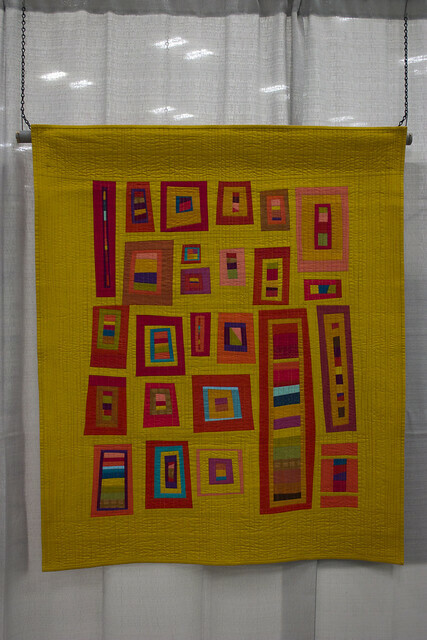 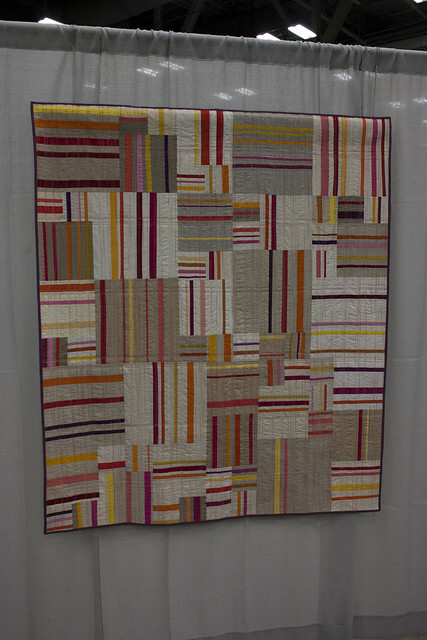 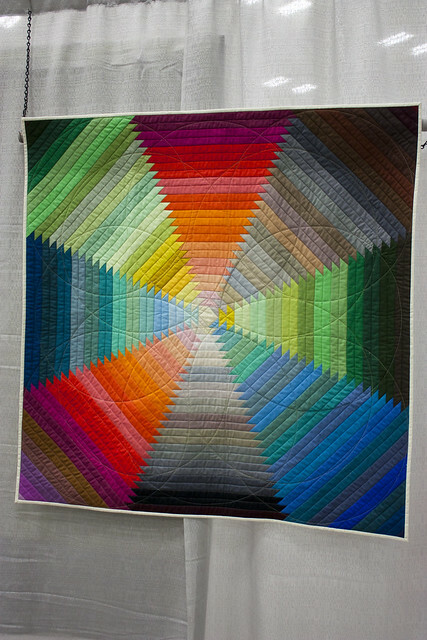 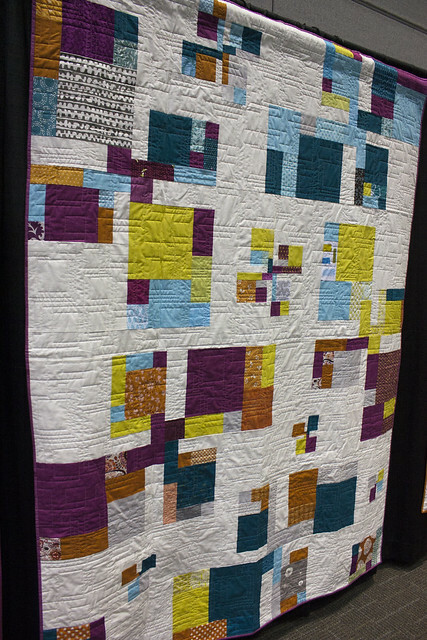 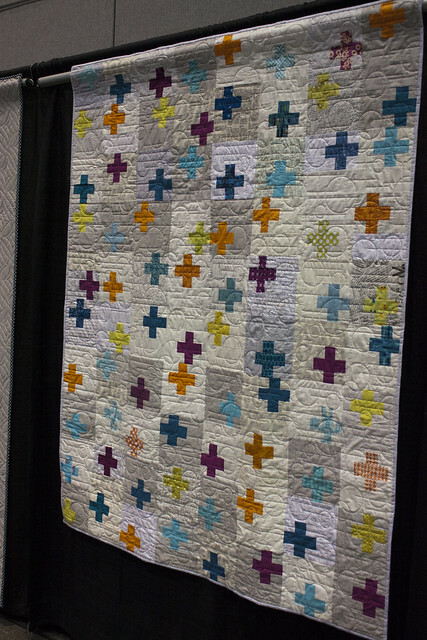 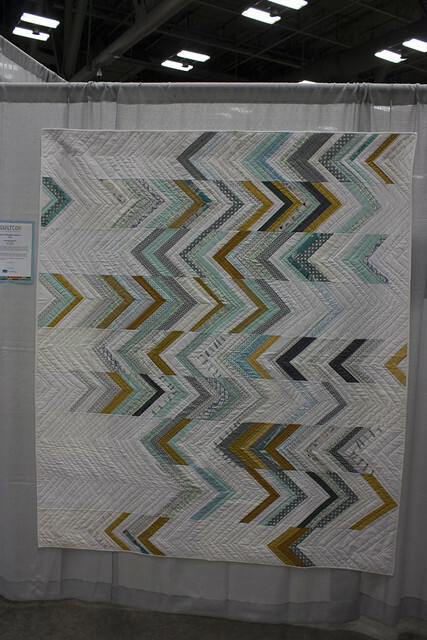 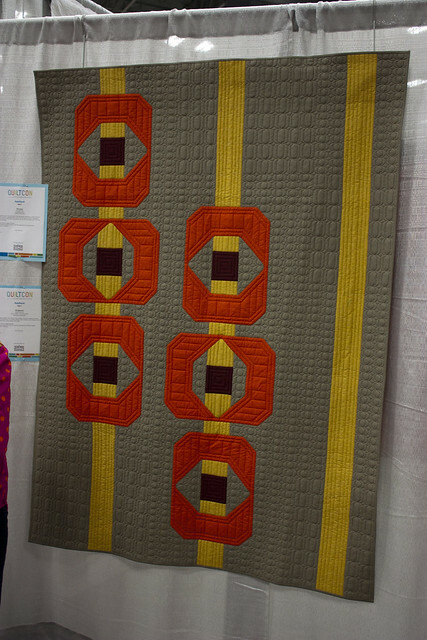 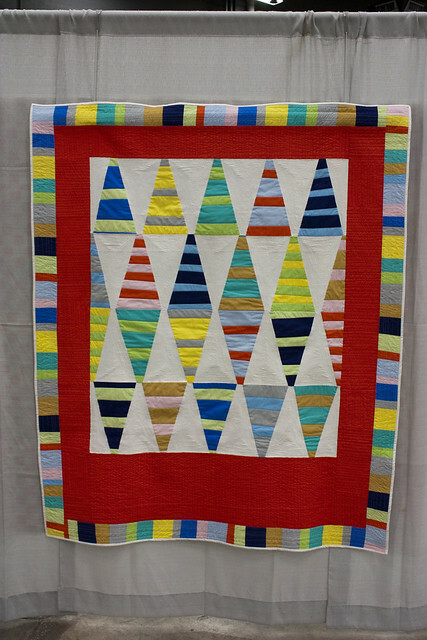 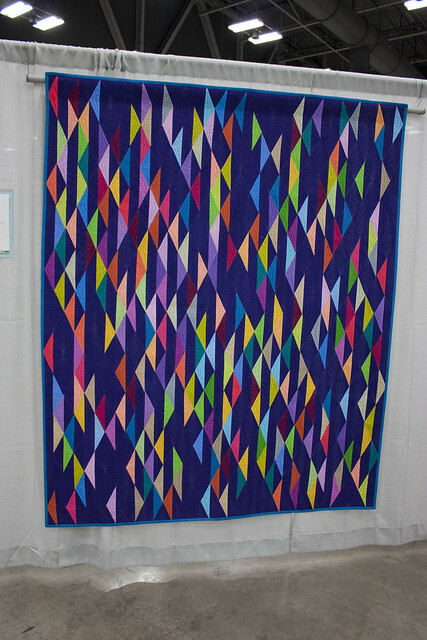 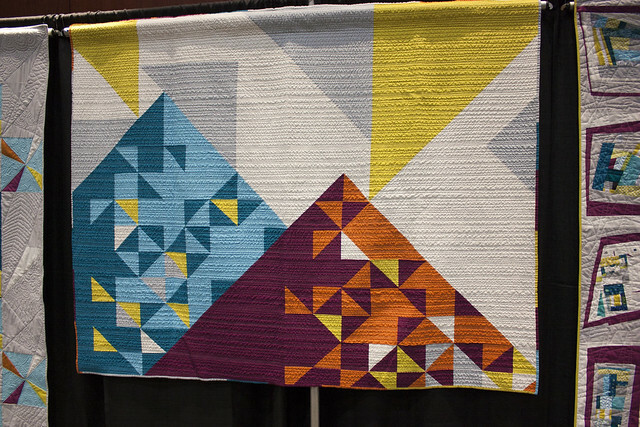 Modern Quilt Guild chapters were invited to design and make quilts with a predetermined color scheme using an alternate grid. 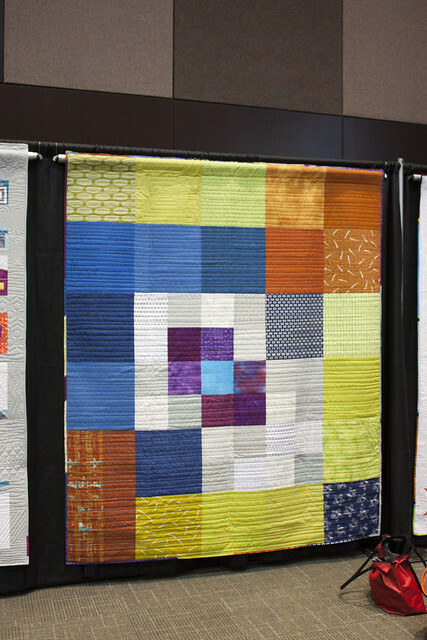 Here are some of my favorites from the charity quilts. 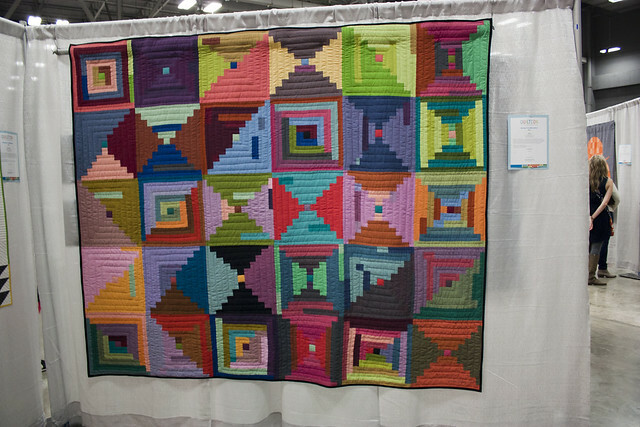 I wish these had been labeled with guild names and participants! 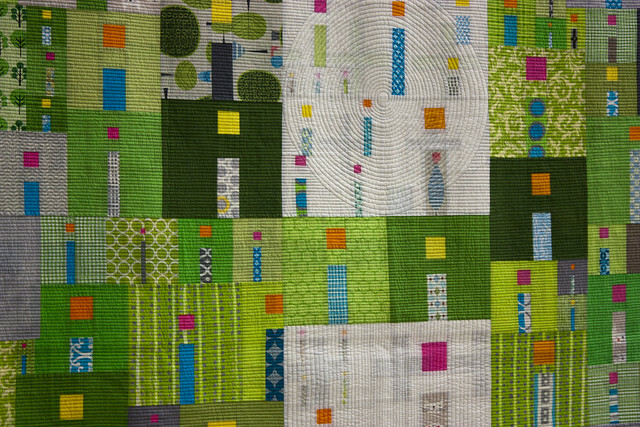 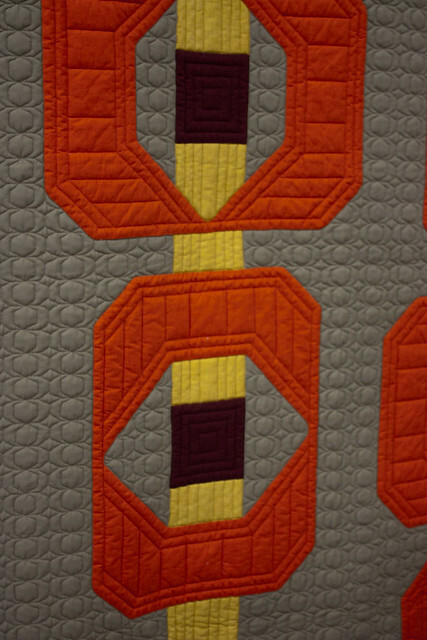 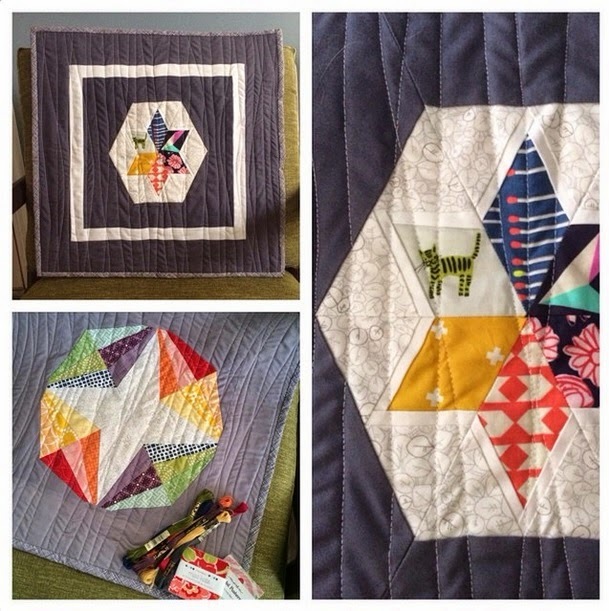 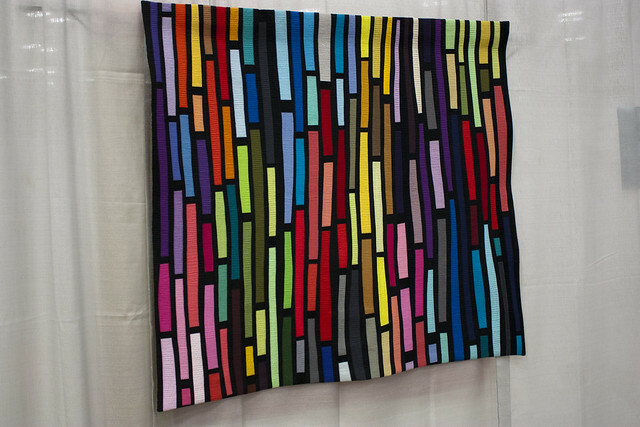 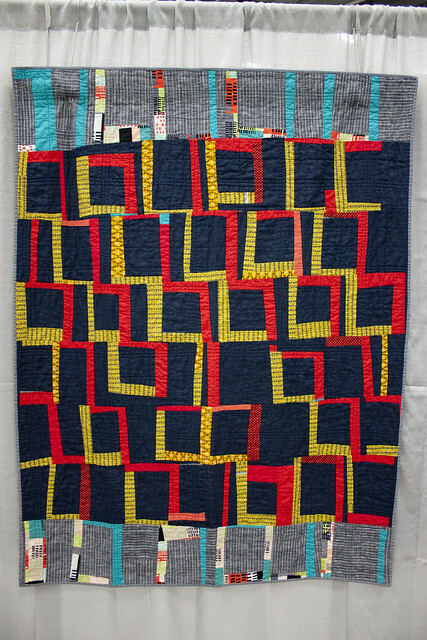 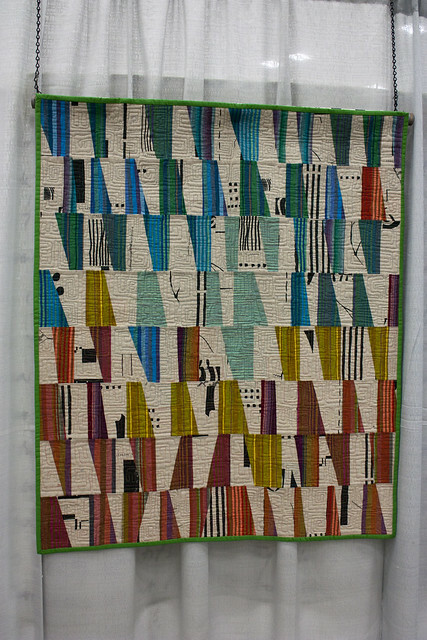 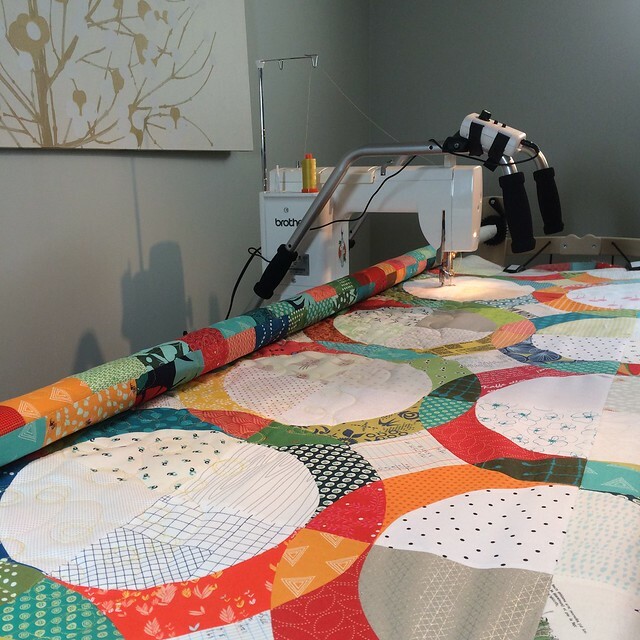 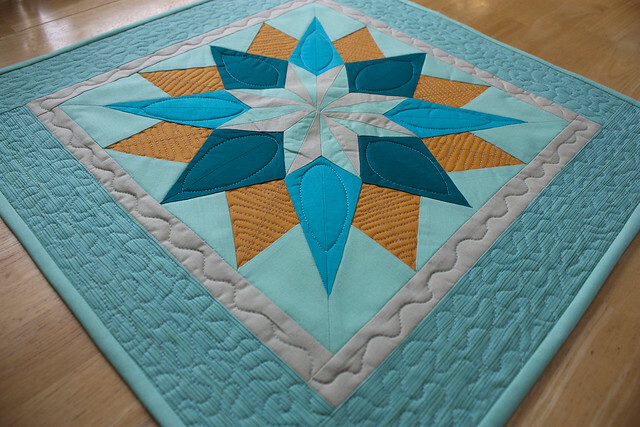 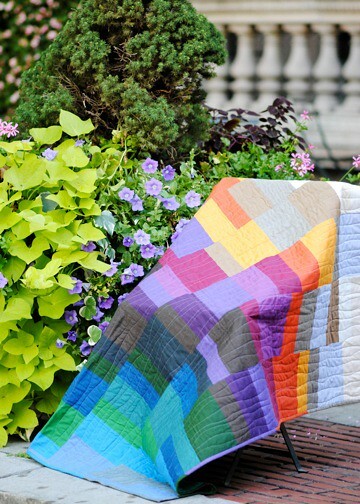 Dana, from the Detroit Area Modern Quilt Guild created this pattern and divided the sewing up between several members. 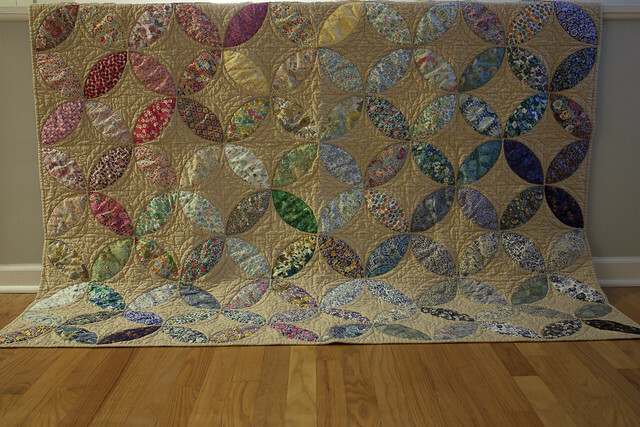 I helped by piecing the backing and making a few blocks. 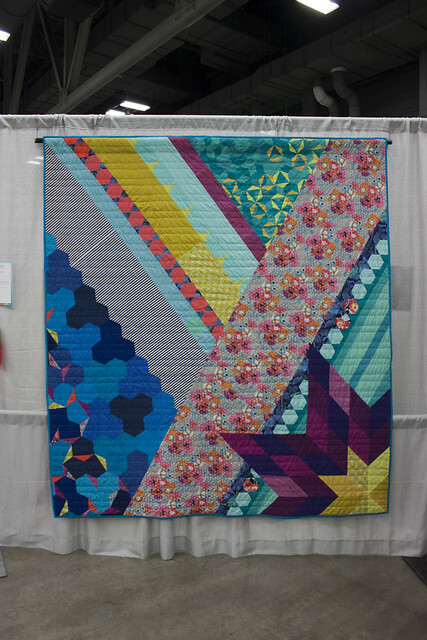 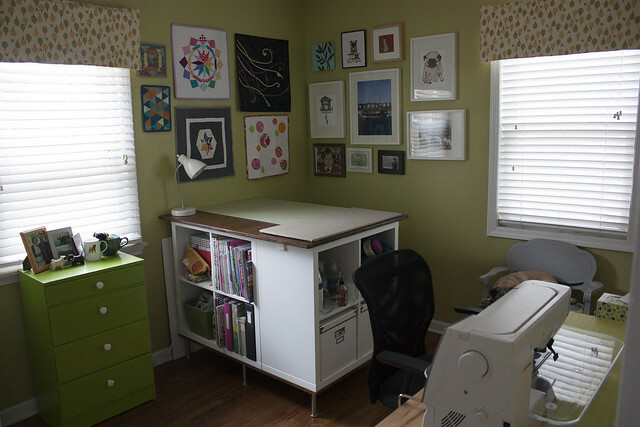 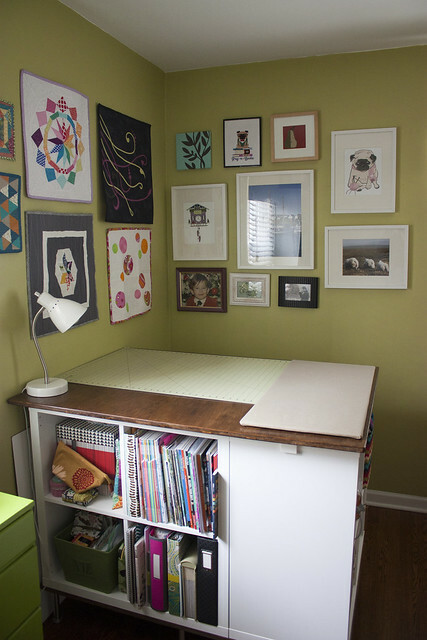 Dana worked so hard to coordinate this and I love the design she created! 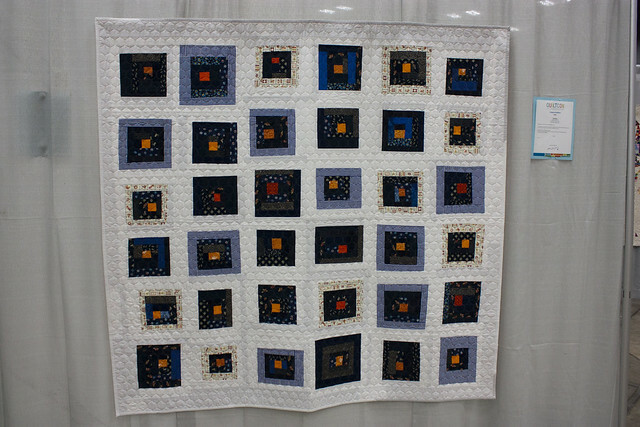 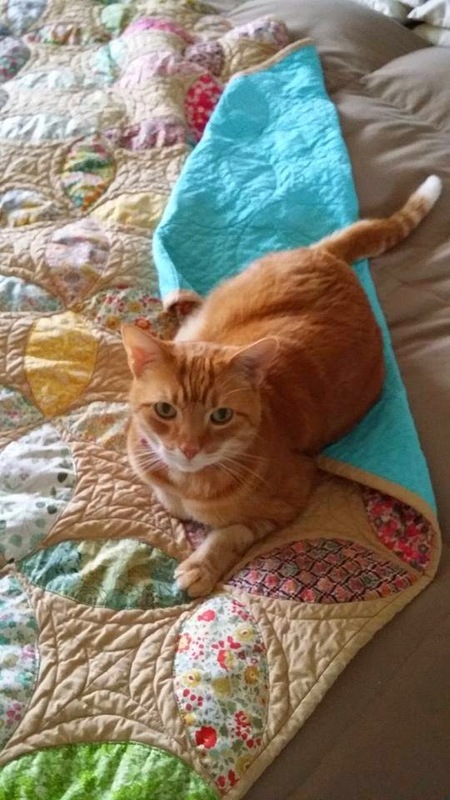 The quilt was quilted by our guild's resident longarmer, Barb. 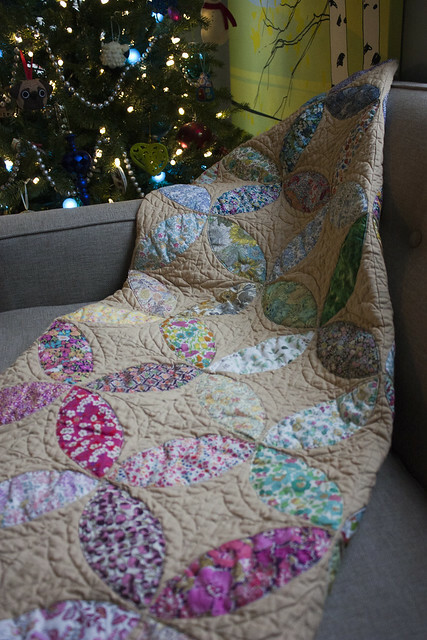 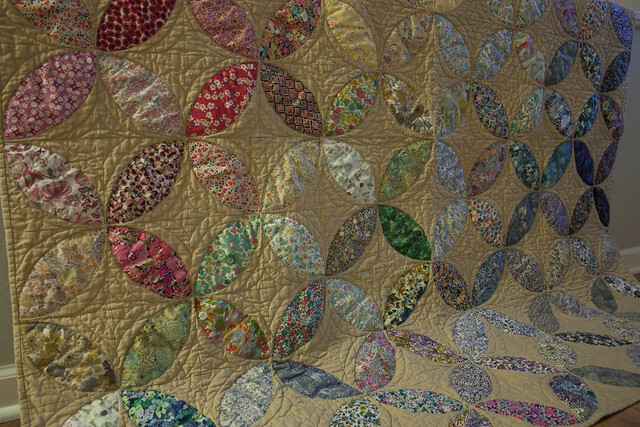 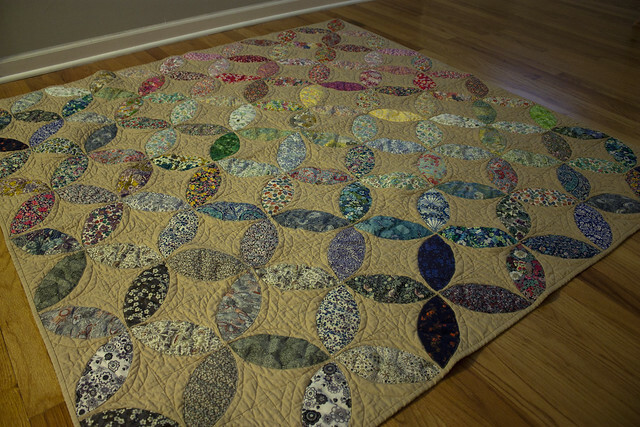 I loved the giant pebble quilting on this one. 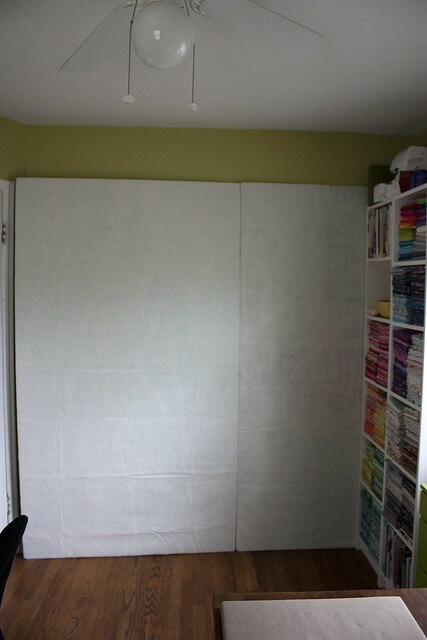 I'm going to try this sometime. 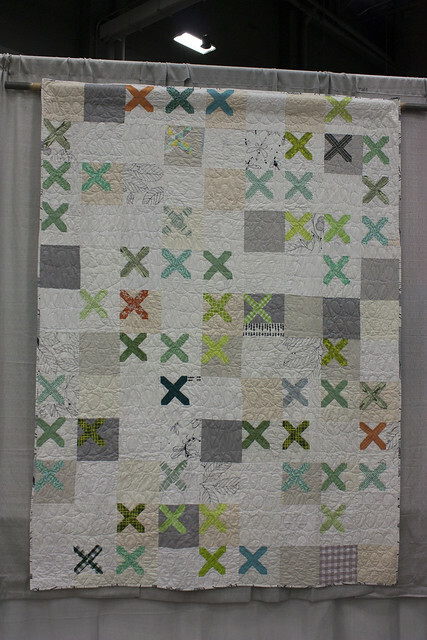 I love these pieced x's and also want to give this a try.